Cissy and I made these cupcakes earlier last week, before we had ANOTHER hailstorm and temperatures that dipped down in the 30's again! Isn't this teapot the cutest? My sister sent this to me for my February birthday. I'm serving some Darjeeling today. Would you like a cup? This Royal Albert teacup that my mom gave me from her stash, looks like a Springtime bouquet, doesn't it? Some of the gold gilding has worn off, but that just means how much it has been used and loved. My youngest son gave me this darling basket as an Easter gift. I'm actually using it on my kozy kitchen table. 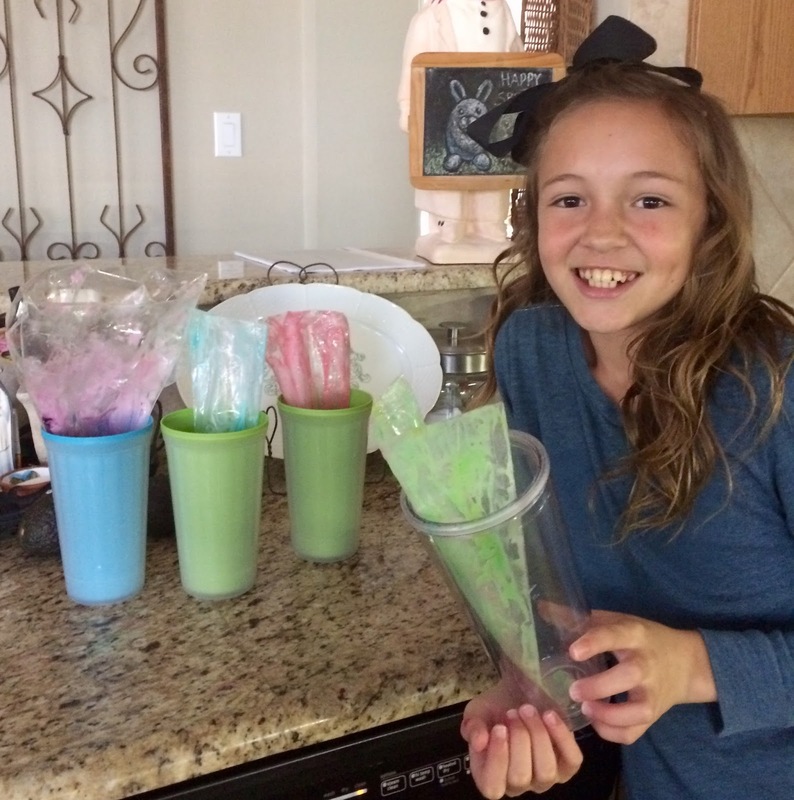 Cissy and I had disposable decorating bags that we filled with white cake batter that we colored in Spring colors. 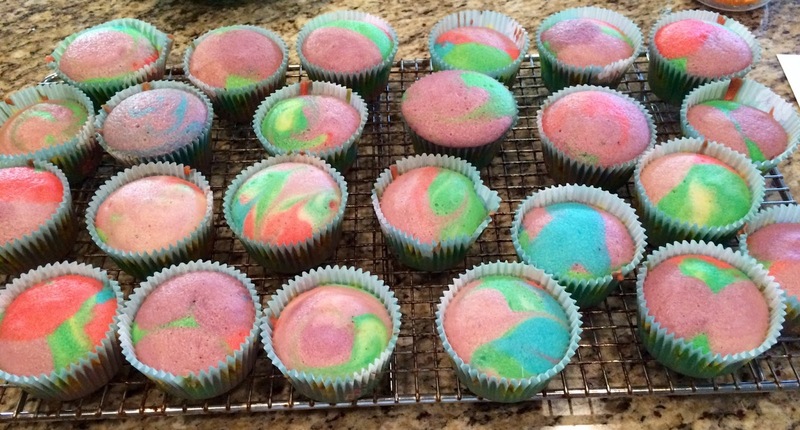 We took turns in adding squirts of batter to our cupcake liners. Just look at these happy cupcakes! Here's the happy girl with one of her cupcakes that she took home to her family. Aren't the cupcakes beautiful inside with all those pretty, marbled colors? Cissy used a toothpick on some of them, to swirl the batter; others, she just left to see how they turned out. We frosted them with a green buttercream. Dishing It! & Digging It! Dear Kitty,that teacup is really gorgeous and the teapot is very cute!Your table is pretty as ever and those colorful cupcakes look so beautiful and delicious!Cissy is adorable!Happy Spring,dear friends! What an adorable teapot! 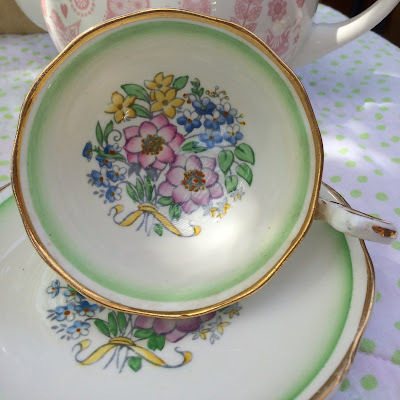 Your mom's pretty green teacup is perfect for spring. I'm also a fan of the gold gilding. The colourful cupcakes made me smile. Hope your weather has improved. We had an ice storm over the weekend so I was homebound for 2 days. How pretty and springlike they are indeed! Love that green frosting- so pretty! We woke up to an inch of snow after having flooding rain on Sunday so our yard is like an ice rink! I'm pretty sure this will be the first spring ever that we had NO tulips or daffodils. They just never bloomed. Crazy and very sad lol! Those are so cute and I'm quite sure my 8 year old Granddaughter would enjoy doing something like this as well. I'll have to remember this for the next time she's here. Such a beautiful cup and saucer. Happy week ahead! The cupcakes are day brighteners for sure! Love the colors..you gals must have had some royal fun doing all that squirting. =) Always love seeing Cissy's smile too...thanks for sharing. The cupcakes are just beautiful! I love your adorable new teapot along with your pretty spring basket and Cissy's smiling face! The swirled cupcakes are so bright and springy. The weather has been so strange this spring. We've had 40 degree temperature swings with bustery winds, hail, rain and 80 degree days all in one week. Yes, We are having crazy weather also. Love your pretty teacup from your Mom. Those cupcakes look like you both had fun designing them. Look tasty, too. You were having quite a few international visitors on your live feed just now. Have a great week, Kitty. How sweet, Kitty! Yes, I would love a cup of tea and cupcake! Oh how cute! My first thought when seeing the cupcakes...how did they do that? So fun! Love the teapot..so cute! And the basket is wonderful! A perfect spring tea...whether the weather is cooperating or not! I would just love to sit and have a cup of tea out of that darling teapot, Kitty. 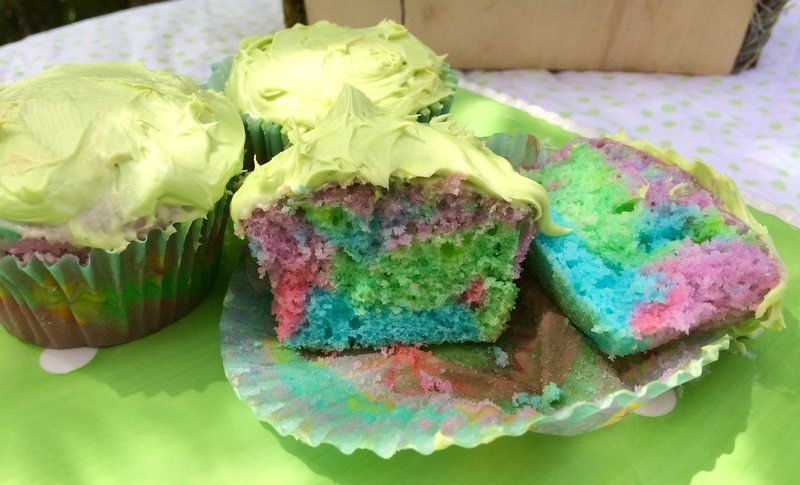 Those are some colorful and fun cupcakes...just perfect for spring. I'll take one (or two) of those too! HUGS! Hello Kitty, oh those cupcakes are so pretty and perfect for spring!!! You and Cissy must have so much baking together. Thanks for sharing at C&C with J&J. What a cute idea! Cissy's smile says it all. I admire you for spending this kind of time with Cissy. I know she loves these cooking adventures. 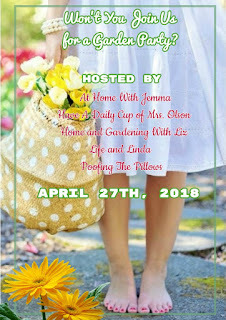 There's lots of pretty colour in this post - the teacup, your new teapot, the garden planter, and to top it off, those cupcakes. What fun! Love the tea pot and my, what a beautiful tea cup. Love and hugs to you! Oh, what pretty cupcakes and so appropriately name! I am sure the grands loved those. 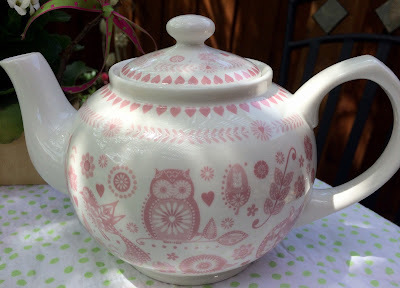 Thanks for sharing and also sharing that cute owl teapot! 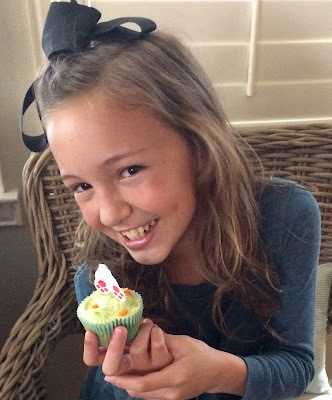 What FUN cupcakes...I just love seeing Cissy's smiles & how proud she is of her creations. I bet they were delicious, too! What a fun idea for the cupcakes! Kitty, I'd love to have a cup of Darjeeling with you. The basket from your son caught my eye right away in the first photo. The bird and the ferns especially. You all did a great job on the cupcakes! What a neat idea to swirl the colors like that! Every time we think spring is here, winter shows us who is boss, doesn't it? Your springy looking cupcakes brought spring indoors, at least. :) Praying for you, sweet friend. Those cheeks on Cissy are as adorable as those cupcakes!! What a great idea piping the cake mix into the paper cups. Your new tea pot is pretty and a lovely basket you received. 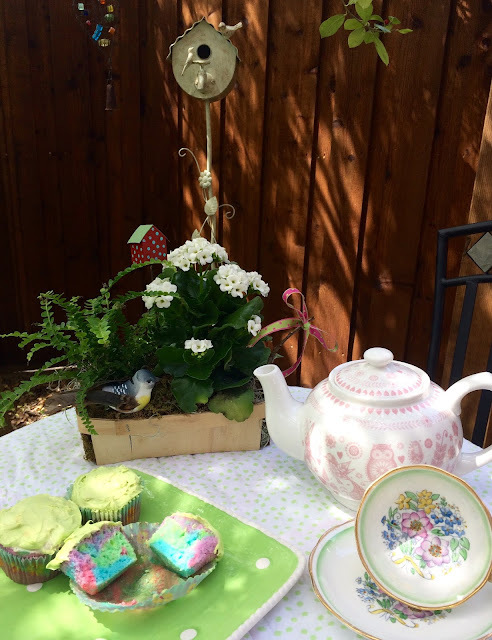 Your Springtime Cupcakes will be a great addition to tea on the patio. At last we are having some spring weather and sure hope you are enjoying it as much as we are! I always enjoy seeing you having so much fun with your Grands! Thanks so much for sharing your awesome post with us at Full Plate Thursday and hope to see you again real soon! They certainly ae a happy cupcake and that smile says it all! Oh, to have tea in the garden. What a delight Kitty! I set up a little bistro set by hilltop cottage hoping to do the same soon. :) Thanks for sharing with our garden party. Your dishes are so pretty and what a fun baking experience to have with a granddaughter. The basket that you got for Easter is just adorable! And of course you always have the cutest little models to show off your goodies! Happy Spring sweet lady! Perfect for a garden party!!! Aw, how sweet is this post! Cissy has the most beautiful smile. Look at those dimples! I love your floral plates....they are perfect for a garden party! I'm linking from Poofing the Pillows. Your new teapot is so pretty Kitty. Cissy is a natural. With that amazing smile, who could resist. I am so thrilled you have joined our garden party. The swirled cupcakes are so pretty. Thanks for sharing Kitty. Have a lovely Sunday. Adorable cupcakes and cupcake eater. What a cute post! That teapot is the cutest. 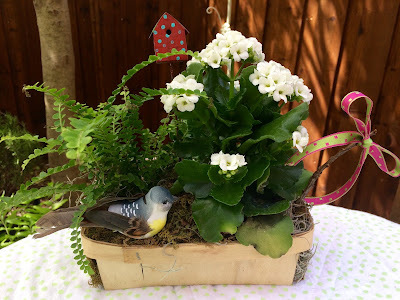 I like the flower arrangement your son gift you- the little crate like basket is a cute look! Your granddaughter is having fun and learning skills for home baking- what a great way to spend time together! Thank you for joining the new Garden Party! Spring in Bloom and Happy Earth Day!